This article contains facts and information about the life and times of the famous Native American Indian chief known as Red Cloud. Who was Red Cloud and why was this Native Indian chief famous? Summary: Red Cloud (1822–1909) was a famous Native America chief and war leader of the Oglala Sioux Indians who fought against the US government's attempts to build forts along the Bozeman Trail in Wyoming and Montana. This conflict became known as Red Cloud's War 1865–1868. He died on the Pine Ridge Reservation in South Dakota in 1909. The following fact sheet contains interesting facts, background history and information about the life of Red Cloud and the events in history that led to his fame as a great Native American Indian leader. Wars: The Sioux Wars (1854 - 1891), Red Cloud's War (1865–1868). One of the most notable individuals during the tumultuous era of fights between the Native Indians and the colonizers is Red Cloud. Red Cloud was born in the year 1822 in the land of what is now known as Nebraska. He was a child of high profile individuals from each of their clan. His mother was Walks as She Thinks who came from the Oglala Sioux also known as Oglala Lakota. His father on the other hand was a warrior from Brule Lakota named Lone Man. Unfortunately Red Cloud lost his father at a young age of five. When his father died, the custody of Red Cloud was assumed by his uncle from the mother side, a chief of the Oglala Sioux named Smoke. He showed immense promise as a warrior even at a young age and his uncle played a huge role in his development especially when his mother died in 1825. His potential was demonstrated during the battles that their tribe had against the neighboring Indian Tribes of Pawnees and Crow. He was able to gain a lot of experience during these battles. Red Cloud was the war chief during a two year conflict which was forever known as Red Cloud’s War. In 1866 the US army began to build a road in Powder River country from the Oregon Trail to the goldfields of Montana. The main objective of Red Cloud was to prevent the White Americans in invading the lands of the Native Americans in Wyoming and Montana. Red Cloud showed the white Americans their strength during their little skirmishes which demonstrated how strong their tribes were. That may have been the reason why the American government offered a treaty during 1866. However, Red Cloud refused to sign the treaty and even stormed out during the negotiations and continued to show their superiority over the American troops which were dispatched within their region. In November 1866, Red Cloud led a massacre of a particular American infantry which were dispatched to fight them. A group of 81 men including two civilians was led by Captain J. Fetterman was dispatched from Fort Phil Kearny. They were task to dismantle a small Indian raid that was reported to their camp. Crazy Horse acted as a decoy leader helping to lure Lt. Colonel William J. Fetterman and 81 soldiers from Fort Phil Kearny into a trap. With 81 American fatalities, the Fetterman Massacre was the army’s worst defeat in the West until the Battle of Little Bighorn in 1876 and spread terror amongst the white settlers. However, the lands of the Sioux was again threatened by miners who found out that gold was abundant in their area. Fellow tribesmen Sitting Bull and Crazy Horse stood up and fought the invaders but Red Cloud stayed out of the war. Instead, he and his people chose to settle in the reservation camp provided for them by the government. Throughout the remainder of his life, Red Cloud showed diplomatic skills which impressed the colonizers. He worked hard for the improvement of the lives of his people. He acted mainly to help their lives in the reserve. 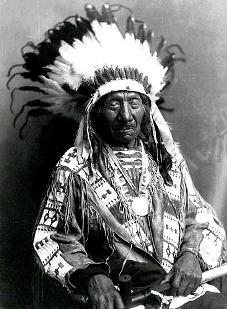 He died in the reservation due to old age on December 10, 1909. For additional facts and information refer to the legend and story of Red Cloud. Red Cloud! Discover the vast selection of pictures on the subject of the tribes of Famous Native Americans such as Red Cloud. The pictures show the clothing, War Paint, weapons and decorations of various Native Indian tribes, such as the Oglalla Sioux tribe of Red Cloud, that can be used as a really useful educational resource for kids and children of all ages studying famous Native Americans such as Red Cloud. We hope you enjoy watching the video - just click and play - a great educational resource for kids.